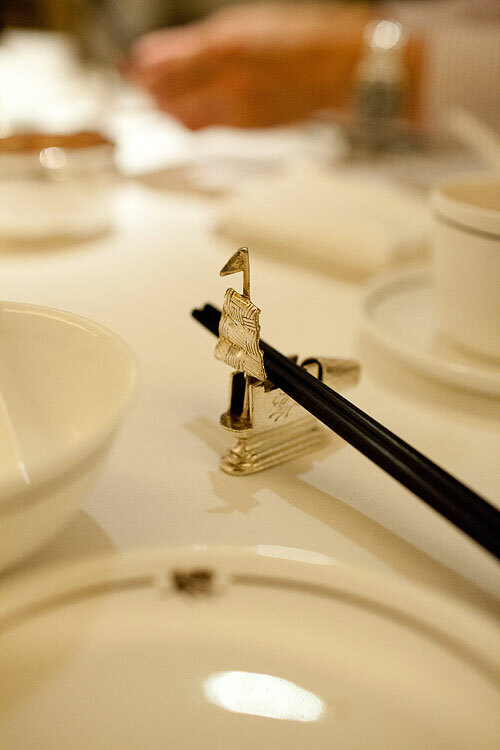 Situated inside the classic Peninsula hotel, Spring Moon is a Chinese restaurant with 1920s decor. Oriental rugs and dark brown old furniture create a completely different world than Peninsula western lobby interior. 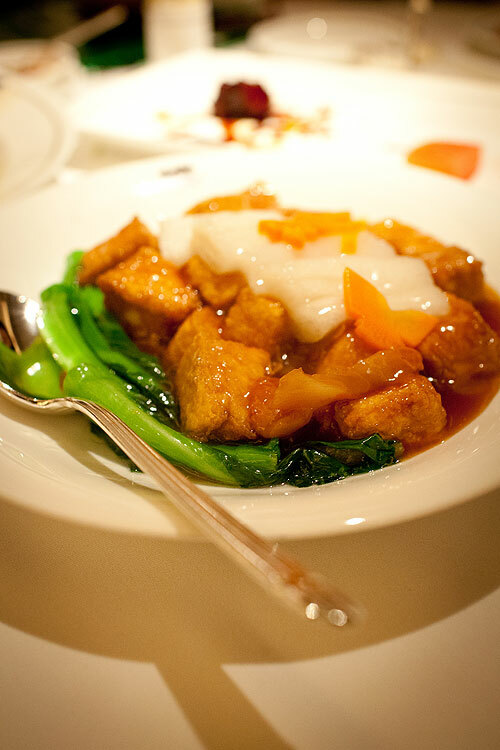 Best known for its popular mooncakes which are always sold out two months before Mid-Autumn Festival, this place is also famous for the high-quality Chinese cuisine. Our dinner starts with the Marinated Duck Tongues with Hua Diao Chinese Wine (花雕醉鴨舌). I seldom have duck tongues done in Chinese wine, but this is good. 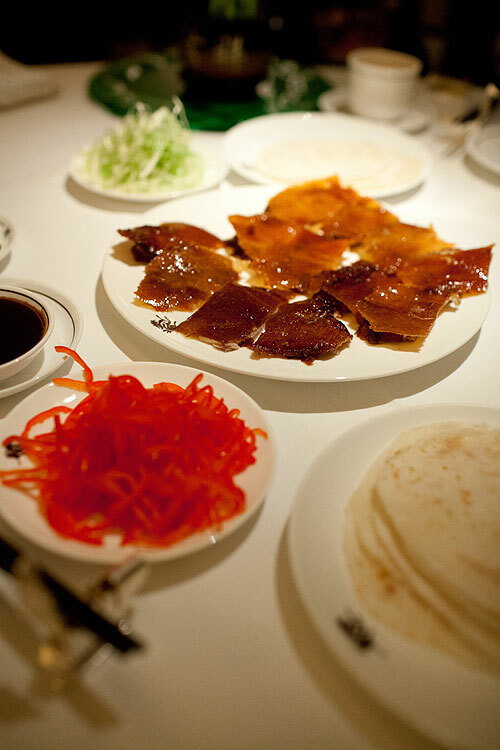 Our first main course is the Peking Duck (北京田鴨). This is an ordinary dish done in high quality. The crispy skin and the extremely thin layer of fat immediately make it one of the best Peking ducks I have tried. I am surprised to see that they provide shredded red sweet peppers, as many of the restaurants only give you shredded cucumbers instead. The second serve (二食) surprises us. 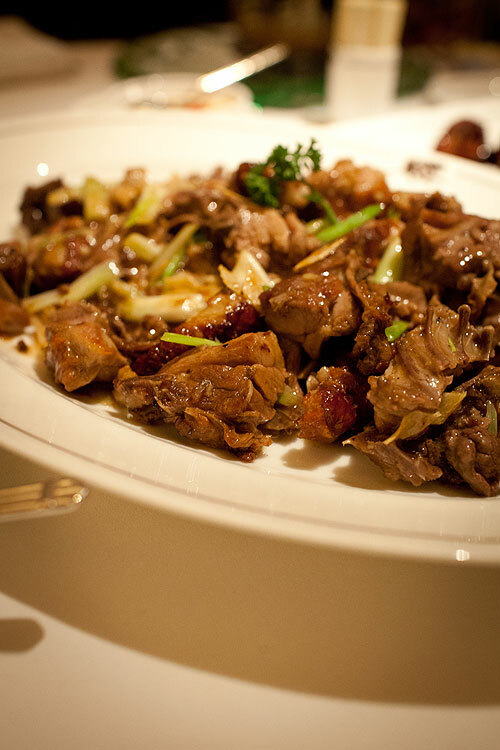 First serve only takes the outermost meat part, and what is left will be done as the second serve, which is fried duck meat with vegetable. Many people may worry if they can get back most of the leftover, but here you can be sure they will. This second serve is big and wonderfully cooked instead of a sloppy leftover mix. That is where you can see how much the chef cares about food. The next one is not a fancy dish either. 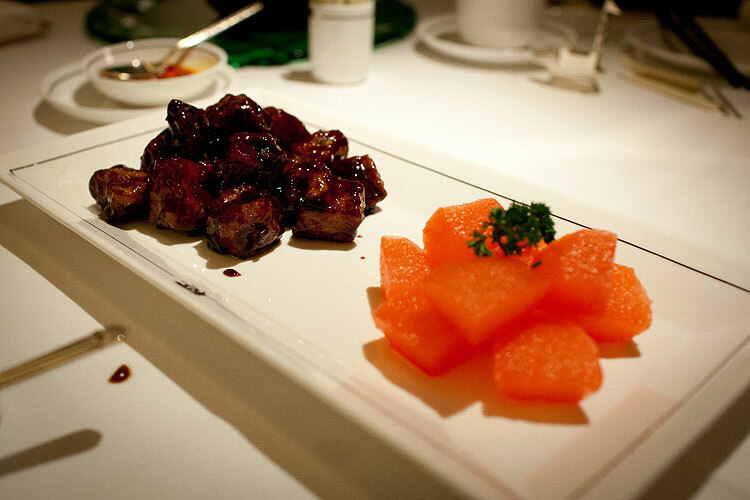 The Spare Ribs and Pear Flavored with Dark Vinegar (桂花梨黑醋排骨) probably won't surprise you by its appearance or taste, but the heavy taste of dark vinegar goes unbelievably well with the fresh pear in osmanthus flavour, forming an interesting and harmonious combo. 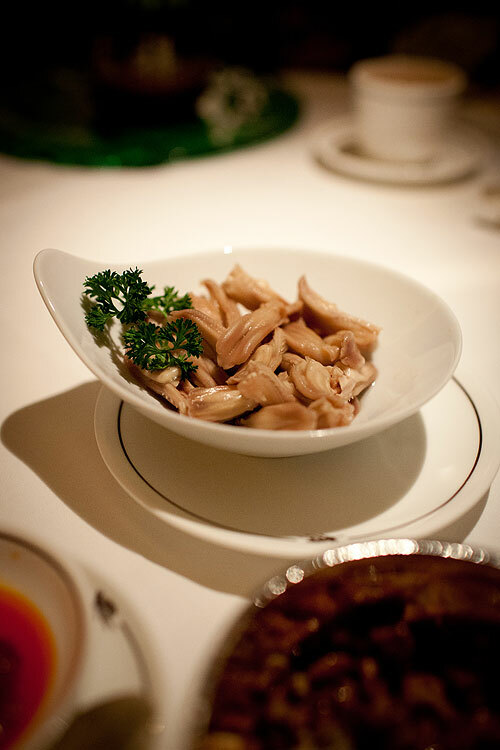 There must be vegetable on the table for a balanced healthy meal, and we order this Braised Bean Curd with Bamboo Fungus and Dried Fungus (棆耳竹笙燒豆腐). Again, nothing fancy but I enjoy it very much. Tofu is silky while the bamboo fungus is thick and fat. Only with such good ingredients can this ordinary dish shine on the table. 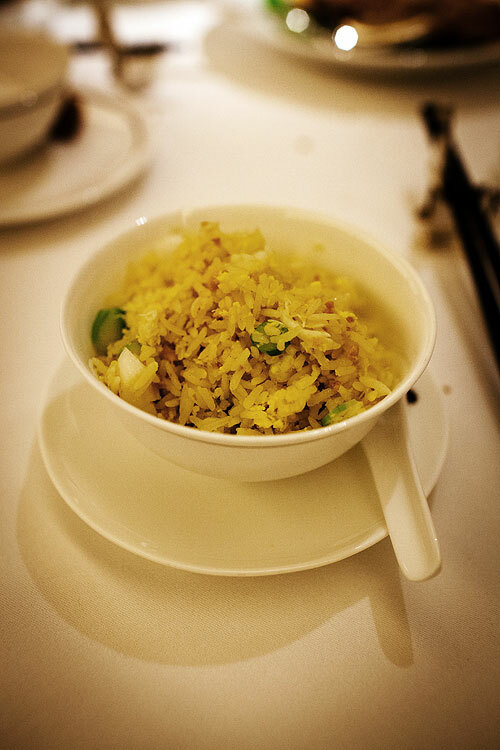 We finish our meal with Fried Rice with Diced Scallops, Crab Meat and Garlic (蒜香蟹肉帶子炒飯). Again, despite the unsurprising materials, the rice is evenly cooked with no trace of oil, while all ingredients are very well mixed. Spring Moon, there is nothing you can complain in Spring Moon. Everything is of high quality as every ingredient is carefully chosen and prepared, and all you taste on the table is the true taste of food without any excessive condiments overwhelming the dish. What is special about this place is also their wide variety of tea, which has to be ordered separately. 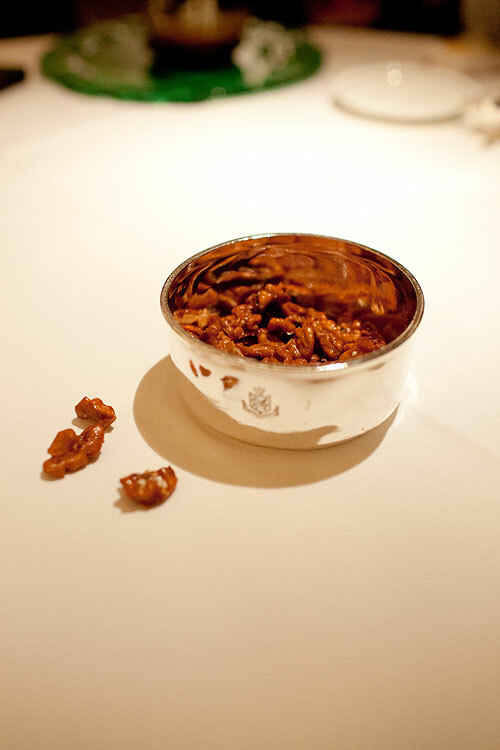 We have not tried any, but we are quite sure that the tea will come in high quality just like the food we order. The wonderful food here however does not come with a hefty price tag. Along with the comfortable setting and fantastic service, you will agree that every penny you spend here is worth it.